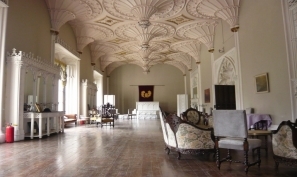 Charleville Castle is said to be Francis Johnston's masterpiece. This beautiful castle, which was left abandoned during a large part of the 20th century (from 1912 until 1970), survived vandalism and onslaughts. In the mezzanine, the main rooms with their spectacular ceilings are now open to visitors. 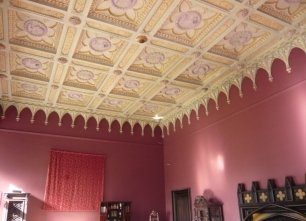 Within the dining room, the ceiling owes its look to the talented William Morris, who stenciled it in the late 1860's. Charleville Castle can be described as a quite compact building (unlike many gothic rambling castles built by the Victorians) with castellations and towers. Alongside the main part of the building, there are a small gothic chapel, the former kitchen and the stables. Francis Johnston was born in Armagh, Ireland. He is the son of William Johnston, who also was an architect. Francis Johnston studied architecture and practised in Armagh for some years before moving to Dublin about 1793. In 1805, he was appointed to the Board of Works. In 1824 he was made president of the Royal Hibernian Academy of Arts which has been founded the previous year, and he provided headquarters for the Academy in Lower Abbey Street at his own expense. He was its president until 1829. Francis Johnston first trained under the architect Thomas Cooley. Two early projects were the completion of Rokeby Hall and Ballymakenny Church, Co.Louth, to the designs of Cooley.At a time of huge rebuilding in Georgian Dublin, Johnston was one of the architects responsible for Sackville Street (now O'Connell Street). The great Pillar (destroyed by a bomb in 1966) and General Post Office (GPO) were designed to harmonise with each other in the street adding grandeur and elegance to the boulevard.His work is interesting from an architectural point of view, in that it spans both Neo-Classical and Neo-Gothic styles. His Chapel Royal in Dublin Castle is a fine example of an early Gothic revival church in Dublin. On this project, he worked closely with George Stapleton. The chapel proved a seminal building for later Gothic revival architects in Ireland. Among his other most notable projects were the construction of St.George's Church on the North side of Dublin, overseeing the conversion of Parliament House into the Bank Of Ireland and the construction of the Tudor Gothic gateway to the Royal Hospital, Kilmainham. In 1813 he began to work on Richmond Gaol as a prison to relieve the pressure on Newgate Prison, Dublin, which had been designed by his teacher Thomas Cooley. William Morris was born in Walthamstow (East London). He was educated at Marlborough and Exeter College, Oxford. In 1856, he spent a year as apprentice at the office of George Edmund Street, one of the leading English Gothic revival architects. Morris is best known as a designer of wall coverings, stained glass, carpets and tapestries and is considered as a pioneer of the Arts & Crafts movement. His philosophy was to reject the tawdry industrial manufacture of decorative arts and architecture in favour of a return to hand-craftsmanship, raising artisans to the status of artists, creating art that should be affordable and hand-made, with no hierarchy of artistic mediums. In 1861, Morris founded a design firm ("The Firm", which would later become Morris, Marshall, Faulkner & Co.) in partnership with the artist Edward Burne-Jones, and the poet and artist Dante Gabriel Rossetti. The compagny was specialized in stained glass, furniture, carving, wallpaper, carpet and tapestries. "The Firm" had a profound impact on the decoration of churches and houses into the early 20th century. One of the most exquisite tapestries produced by the company was The Woodpecker, designed entirely by William Morris. It was shown at the Arts & Craft Exhibition Society in 1888. In the late 1860's William Morris was the guest of the Earl at Charleville Castle. He stayed longer than expected (nearly three months), loved the ambiance of the building and set about the redecoration of the Dining Room (now called The William Morris Room). Unfortunately the exquisite wallpaper he designed (and made on site) was damaged during the period in which the castle was falling into decay with the roof valleys destroyed. Fortunately, a sufficient sample was rescued and presented to the Victoria & Albert Museum in London - perhaps one day its elaborate pattern of gold leaf print on red will be reprinted and re-installed at the castle. The matching gold leaf stencil placed by William Morris on the ceiling survives undamaged and gives some hint of the richness of texture and refinement that William Morris brought to this great building. Stiple-work patterns carried out by William Morris on the ceiling of the Library (now - the Anthony Cronin Room) remains relatively intact and amenable to full restoration. Good Company Productions’ ‘Mí na Meala’ is returning for a fourth season on TG4 this September 22nd at 8pm . 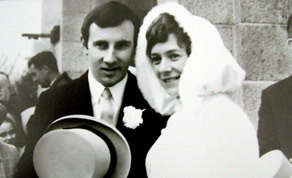 ’Mí na Meala’ features Irish married couples who met in the 50’s, 60’s, 70’s and 80’s, reminiscing on their courtship, their wedding and their honeymoon. The series gently touches on travel, changing times, the evolution of marriage and relationships with a gentle humour. Couples will first take us through their first meeting, their courtship and marriage using photos, memorabilia and appropriate archive, before the couple returns to their original honeymoon destination. The nostalgia of the previous seasons continues in season four where we will see couples from Dublin, Letterkenny, An Rinn, Gortahork, Cape Clear and Derry head back on their honeymoons to Austria, Venice, Croatia, Spain, Cornwall, Bangor in Wales, Barra in the Hebrides and Dingle Co.Kerry. The 8x25 series is produced and directed by Evan Chamberlain. ’Mí na Meala’ is currently in post in High Wire and Lime Street Sound and is being cut by David O’Brien and Mary Crumlish. Other Good Company Productions which are soon to be broadcast on TG4 include new format ‘Pitch Perfect’. Produced by Evan Chamberlain and Grainne O’Carroll, filming is currently underway on the series, which aims to create a choir of singers from GAA clubs throughout the country, to perform centre stage at the Dublin v. Kerry All Ireland Football Final this September. Filming for the series is taking place in locations such as Maynooth College, the Gaiety Theatre and the National Concert Hall. Notable Guests on the Series so far include Anuna, Colm Wilkinson, River Dance percussionist Ian McTigue, Barber Shop Quartet “Four in a Bar” and Rock Band “Stand”. The 30 strong choir has been formed and are now getting ready for the Final Showdown in Croke Park on All Ireland Sunday on the 18th September when Dublin take on Kerry and our Choir will find out if they are in fact “Pitch Perfect”. Post Production on the series has now begun in High Wire with Colin Campbell off lining. ‘Pitch Perfect’ will be broadcast on TG4 from mid October. Good Company Productions have recently finished filming season four of TG4’s/Good Company Productions’ hit farming format ‘Feirm Factor’. The production has recently returned from Shropshire in the UK where they filmed the penultimate programme with the final four farmers at Harper Adams University. 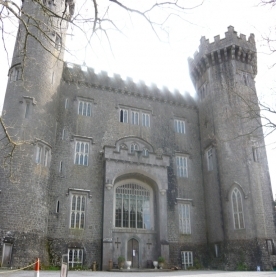 The final showdown was filmed in Charleville Castle in Tullamore. The series aims to find Ireland’s top farmer and is presented by Maura Derrane (Four Lives). Post has begun in High Wire ahead of broadcast in January 2012. Catch ‘Mí na Meala’, ‘Pitch Perfect’ and ‘Feirm Factor’ in TG4’s upcoming autumn schedule.